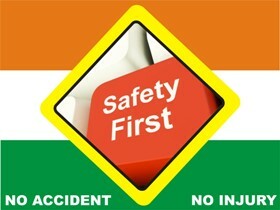 "Safety First" afterall Human life is precious, this message is embibed in our process and Product. Manufacturing Plants at Rubber King are designed and developed to meet the Target of "Zero Accident", all machines and processes are adequately covered with emergency alertness and STOP arrangement, Personal Protective equipments and Prevention procedures are available at place. Safety aspect is audited by competent persons at regular interval to keept it live, people are trained to face emergencies from Natural calamities.